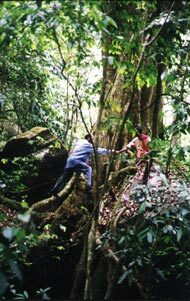 Inheritance India invests in areas that have the potential to become eco-tourism friendly. These are places that lie in the buffer zones of regions that have natural or heritage value. We do this with a view to conserving and restoring the area while making meaningful returns for those who invest in our venture. We have purchased 170 acres of land at two sites lying along the Western Ghats in Kerala, one of the 25 bio-diversity "hotspots" of the world, as declared by the IUCN (UN charter). This area has over 1700 species of plants, 22 species of mammals, 95 species of reptiles, 90 species of amphibians. On the land we have identified in just 2 hectares of land over 55 species of trees measuring over 10 metres in height. We create Eco-Tourism Zones in the area that will provide meaningful and unforgettable experiences for the eco-traveller while simultaneously contributing towards the preservation of the area's natural and heritage value. We are currently identifying other such locations around India where the model could be replicated to create a network of special places. Ideas similar to ours are that of Natural Capitalism and Socially Responsible Investing. We invite you to explore the investment opportunities available.